Part of practicing extreme self-care as a health care practitioner is learning to listen to your own inner wisdom for direction. This wisdom of the voice of your Wise Self is the voice of your soul. Your Wise Self is your connection to the Divine, and as you learn to listen to its wisdom, you will find yourself guided to your most authentic life, your most authentic self as a leader, no matter what your formal or informal “leadership position” may be. How you spend your time reflects the priorities that you are honoring in your life. Where would I prefer to spend more time? What parts of my life need less attention? Do I have a secret dream I keep putting off until I can “find the time”? What is it? Contact Donna Strickland at (303) 808-4880 to learn more about hiring her for a workshop or presentation. 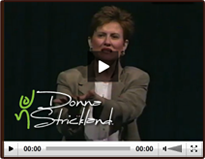 This entry was posted by Donna Strickland in Dynamic Keynotes, Free Resources, Leadership and Team Development. Bookmark the permalink. Follow comments with the RSS feed for this post. Post a comment or leave a trackback.